Of considerable importance to climbers, and to those who live and work permanently at altitude, is their capacity to do work. Clearly, the harder you are working (the faster you climb), the more oxygen will be needed. For lowlanders, the ability to do work falls rapidly at altitude: the work capacity at 7000 metres is less than 40 per cent of that at sea-level. Without oxygen, the rate of climb can be very slow indeed: in 1952 it took Raymond Lambert and Tenzing Norgay five and a half hours to climb just 200 metres on the South Col of Everest; and at the summit of the mountain, Reinhold Messner found that he and Peter Habeler collapsed into the snow with exhaustion every few steps, so that the last 100 metres took over an hour. Similar difficulties are experienced by unacclimatized individuals at lower altitudes. Permanent residents, however, have a remarkable work capacity. Air travelers arriving in La Paz feel instantly exhausted due to the thin air and are surprised (and chagrined) to discover the locals running a marathon! The use of oxygen to conquer Everest led to the belief that it was not possible to survive on its summit unassisted. Indeed, Dr. Griffith Pugh, a physiologist on the first expedition to reach the summit of Everest, claimed that 'only exceptional men can go above 8200 meters without supplementary oxygen'. His statement was supported by a number of tragic accidents in which elite mountaineers, climbing unassisted, died, usually from exhaustion brought on by hypoxia that caused them to stagger wildly and slip to their deaths. As has so often been the case with high altitude physiology, however, the resilience and determination of the mountaineers proved the scientists wrong, for in 1978 Peter Habeler and Reinhold Messner climbed Everest without oxygen. Since then their remarkable achievement has been repeated by many others, including, in 1988, the first woman, Lydia Bradley (her claim is disputed, since she climbed alone and thus it could not be proved she actually made it to the top). The Chinese were the first to document the effects of altitude, in a classic text, the Ch'ien Han Shu, that describes the route between China and what is probably Afghanistan around 37-32 BC: 'Again on passing the Great Headache Mountain, the Little Headache Mountain, the Red Land and the Fever Slope, the men's bodies become feverish, they lose colour and are attacked with headache and vommiting; the asses and the cattle all being in like condition.' The eminent Chinese scholar Joseph Needham has suggested that such experiences convinced the Chinese that they were meant to stay within the natural borders of their country. Likewise, the Greeks, who found they became breathless on the top of Mount Olympus (around 2900 meters), assumed that the summit was reserved for the gods and was out of bounds to mere mortals. One of the first clear descriptions of the effect of acute mountain sickness was published in 1590 by Father Jose de Acosta, a Spanish Jesuit missionary who crossed the Andes and spent some time on the high plateau known as the Altiplano. Many of his party became sick when crossing the high pass at Pariacaca (4800 meters). He himself was 'suddenly surprized with so mortall and strange a pang, that I was ready to fall' and considered that 'the aire is there so subtle and delicate, as it is not proportionable with the breathing of man.' He also wrote that at this pass and all along the ridge of the mountains were to be found 'strange intemperatures, yet more in some partes than in others and rather to those which mount from the sea, than from the plaines.' This passage has been taken to indicate that Father Acosta was aware that people who had become acclimatized to high altitude by spending time on the high plains, such as the Altiplano plateau, succumbed less readily to mountain sickness than those who ascended directly from sea-level. Scholars now suggest that this is probably not the case, as the original Spanish text appears to have been incorrectly translated. The local Inca population, however, were very well aware of the effects of altitude and of how acclimatization took time. They knew that lowlanders died in great numbers if transported to high altitudes to work in the mines and they maintained two armies, one that was kept permanently at high altitude to ensure they were acclimatized, and a second which was used for fighting on the coastal plains. To escape the ravages of the Conquistadores, the Incas retreated higher and higher into the mountains, where the Spanish invaders found it difficult to follow. Although the Spanish eventually established a city at Potosí (4000 meters), it was very much a frontier town and both women and livestock had to return to sea-level to give birth and bring up their off-spring for the first year. The fertility and fecundity of the native women was unaffected but Spanish chidren born at altitude died at birth or within the first two weeks of life. The first child of Spanish descent to survive was not born until fifty-three years after the city was founded, on Christmas Eve 1598, an event that was hailed as the miracle of St Nicholas Tolentino. Sadly, none of the 'miracle's' six children survived to maturity. Nevertheless, the problem resolved itself after two to three generations, probably because of the interbreeding with the indigenous Indian population. The cattle and horses remained relatively infertile, however, and as a consequence, the Spanish eventually moved the capital to Lima. Infantile mountain sickness is not simply a problem of the past, for it afflicts the lowland Han Chinese colonists of Tibet today. The scientist J.B.S. Haldane - the son of J.S. Haldane - made a scientific study of the effects of nitrogen intoxication using a pressure chamber in 1941. His subjects, who included himself and his future wife, were set arithmetic and manual dexterity tests, the latter consisting of transferring small ball-bearings from one jar to another using forceps. When breathing air at a pressure of 10 atmospheres (equivalent to a depth of 90 metres), all of them became rather confused. One individual, reported to be a thoroughly responsible scientist at atmospheric pressure, cheated in the dexterity test and another alternated between depression and elation, at one moment begging to be decompressed because he felt 'b...awful' and the next minute laughing and attempting to interfere with his colleague's dexterity test. No one managed to get their sums right - as Haldane laconically noted, 'observations were not as satisfactory as could have been wished.' Another difficulty was that the person administering the test was usually as intoxicated as their subject, and often failed to take proper notes or to stop the stopwatch. Such studies sufficed to show that divers suffering from nitrogen narcosis could not be expected to behave responsibly and might react in ways that threatened their own or others' lives. Indeed, some intoxicated scuba-divers have been known to offer their mouthpieces to the passing fish. Decompression sickness is not the only difficulty that faces the diver. Even just immersing the body in water up to the neck causes physiological changes. When you are standing upright on the seashore, there is a pressure gradient down your body due to the force of gravity, which causes the blood to pool in your legs. If you now immerse yourself in the sea up to your neck, this effect is counteracted by the external pressure of the water so that about half a litre of blood shifts upwards from the legs to the chest, distending the great veins and the right atrium of the heart and increasing your cardiac output. One consequence of stretching the atrial wall is that it alters the level of two hormones that influence water uptake by the kidney, and thereby stimulates urine production. This explains why you so often, and so annoyingly, need to pee just after entering the water. Diving suits were first developed for marine salvage. Among the early pioneers were two brothers, John and Charles Deane, who set up business as 'submarine engineers' in the Portsmouth area of England around 1832. This came about in a highly unusual way. While trying to rescue a group of horses from a burning barn, they had the bright idea of using a helmet from a suit of armor, supplied with air via a hose and a hand pump, as a breathing apparatus. It was so successful that they patented the device for fire-fighting. They soon realized that it would also be suitable for diving and by 1828 they had perfected a diving apparatus consisting of a heavy open helmet, balanced on the diver's shoulders, which was supplied with compresssed air via a leather hose from a pump on the deck of the support ship. Providing the diver's head was upright, the helmet acted as a portable diving bell and water was prevented from entering at the bottom of the helmet by virtue of the air that was supplied from above. There is a story, possibly apocryphal, that when one of the first tunnels was being built under the river Thames, the directors decided to celebrate reaching the halfway mark by hosting a lunch in the tunnel. Because it was not yet completed, the tunnel was still filled with compressed air and the guests had to take their lunch in 'under pressure'. Somewhat to their chagrin, the champagne did not 'pop' when it was opened, nor were there any of the usual bubbles, for the pressure in the champagne bottle was the same as that in the tunnel. Nevertheless, despite the flat taste, they all drank the champagne. The bubbly lived up to its name later, however, when the directors and their guests returned to the surface, and to atmospheric pressure, and the champagne they had drunk began to fizz. Exercise can produce more benefits than physical fitness. It can also lift your mood. Chemicals known as endorphins flood the brain of the runner. Their name (endogenous morphine) recognizes the fact that they interact with the same receptors as morphine. Like synthetic opiates they decrease pain, increase relaxation and make you feel good. Anyone feeling mildly fed up with life might be well advised to go out and do some physical exercise. Not only will the endorphins lift your mood, but your fitness will be increased and you will have the added benefit of feeling very virtuous about it all. Although opiates such as morphine and opium are addictive, it seems unlikely that you can become physically addicted to endorphins, which are only present at low levels and have only mild effects. Nevertheless, many fitness fiends do develop some psychological dependence on the 'exercise high' and feel restless and irritable if they are prevented from exercising by injury or illness. Perhaps one should look on this as a blessing. After all, anything that induces us to take regular exercise is beneficial. One of the more immediate benefits of training is the improvement of muscular coordination. When we walk, only some of the individual muscle fibre bundles in our muscles actually contract. When we run, more and more of them are recruited into action. For maximum efficiency, muscle fibre bundles must contract simultaneously. Synchronization of the muscle bundles occurs quite quickly with training, producing a rapid improvement in speed and strength. This is the main reason why it seems much easier to cycle uphill after only a week or two of daily practice. Even with training, the muscle bundles never all contract simultaneously. Were they to do so, the force generated might be close to the limit at which bone breaks. Total synchronization of muscle fiber contraction may perhaps explain the extraordinary power that athletes - and even ordinary mortals - can sometimes generate under extreme stress. Stories of people lifting a car off an accident victim, or of athletes suddenly producing a never-to-be-repeated performance that far outstrips their personal best, are not uncommon. Such synchronization may also have devastating consequences. In 1995, one of the contestants for the World's Strongest Man title generated such force in his arm muscles during the arm-wrestling competition that he snapped his own arm bone. Astronauts often complain that they find it difficult to sleep in space. Undoubtedly, some of this difficulty must be due to the novelty of space flight. Furthermore, spacecraft can be noisy and one's colleagues left on watch may not be silent. But it seems likely that the main cause of sleeplessness is disruption of the body's normal circadian rhythm (its biological clock). Many physiological processes, among them sleep, are controlled by circadian rhythms which, in turn, are regulated by the light-dark cycle. It is well established that people in northern latitudes sleep far less during the Arctic summer, when the sun never sets, than they do during the continual darkness of the Arctic winter. Because the sun rises and sets once once every ninety minutes as the Space Shuttle orbits the Earth, the astronauts' normal light-dark cycle is markedly different. Another serious consequence of prolonged microgravity is wasting of the weight-bearing muscles, due to reduced use. They shrink in size and strength, and become more susceptible to exercise-induced damage. Connective tissues also degenerate. These effects are observed primarily in the legs; the arm muscles seem less affected, probably because the arms are used almost exclusively for work in space. Atrophy of the leg muscles has serious implications, for it may impair the ability of the crew to evacuate the spacecraft unassisted following an emergency landing. The workload of the heart is also reduced in microgravity, both because of the reduced blood volume and because it no longer has to pump against the Earth's gravitational pull. Consequently, the amount of heart muscle declines and there is a measurable decrease in cardiac size after long flights. To reduce bone and muscle loss, all astronauts must spend at least three or four hours each day doing exercises. This is not easy, for exercise in microgravity presents unusual challenges. To use a treadmill, astronauts must be tethered firmly to the surface to prevent them from floating off backwards when they try to run: usually they wear a flexible harness of elastic cords that anchors them down. Exercise bikes and rowing machines have also been used successfully in space. These may sport some unique modifications; the rowing machine, for example, needs no seat to support the astronauts' weight. Isometric exercises, which enable muscle loading without movement, are also used. One example is the rubber-band chest expander used on Earth. Weight-lifting is, of course, not an option. Cosmonauts also wear a 'penguin suit' for several hours a day; this is an elasticated garment that stresses the muscles and partially compenstates for the lack of gravity. The challenge of scaling the highest mountain, exploring the deepest ocean, crossing the hottest desert, or swimming in near-freezing water is irresistible to many people. Life at the Extremes is an engrossing exploration of what happens to our bodies in these seemingly uninhabitable environments. 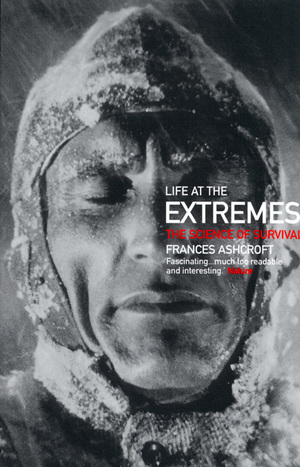 Frances Ashcroft weaves stories of extraordinary feats of endurance with historical material and the latest scientific findings as she investigates the limits of human survival and the remarkable adaptations that enable us to withstand extreme conditions. What causes mountain sickness? How is it possible to reach the top of Everest without supplementary oxygen, when passengers in an airplane that depressurized at the same altitude would lose consciousness in seconds? Why do divers get the bends but sperm whales do not? How long you can survive immersion in freezing water? Why don't penguins get frostbite? Will men always be faster runners than women? How far into deep space can a body travel? As she considers these questions, Ashcroft introduces a cast of extraordinary scientific personalities—inventors and explorers who have charted the limits of human survival. She describes many intriguing experiments and shows how scientific knowledge has enabled us to venture toward and beyond ever greater limits. Life at the Extremes also considers what happens when athletes push their bodies to the edge, and tells of the remarkable adaptations that enable some organisms to live in boiling water, in highly acidic lakes, or deep in the middle of rocks. Anyone who flies in an airplane, sails the high seas, goes skiing or walking in the mountains, or simply weathers subzero winters or sweltering summers will be captivated by this book. Full of scientific information, beautifully written, and packed with many fascinating digressions, Life at the Extremes lures us to the very edge of human survival. Frances Ashcroft is Professor of Physiology at Oxford University and a Fellow of Trinity College, Oxford. She is author of Insulin (1992) and Ion Channels and Disease (2000).